NEW YORK: On September 24th StoryLTD’s newest Absolute Auction of Folk and Tribal Art will go live with an eclectic collection of indigenous art works depicting a vast array of artistic traditions from different regions of India. These techniques represent longstanding regional narrative and customs with colourful hues, varying textures and elaborate compositions. Two techniques represented in this sale include the multi-dimensional storytelling tradition of Patachitra scroll paintings and the family rooted Jogi art. Patachitra, originating in the Eastern Indian state of Odisha, is essentially an ornate cloth-based scroll painting. Although these colourful works have organic and humble roots they offer a wealth of narrative possibilities. “Patta” means “cloth” in Sanskrit while “chitra” means picture or painting. True to the name, layers of cotton cloth are adhered together with a natural glue product and formed into scrolls. Patachitras made of lighter paper materials are sometimes reinforced with saris to extend their life. It is essential that these scrolls remain intact as they are exhibited by traditional story tellers that travel distances and use these scrolls in their performances. The subject is often based on Ramayana or regional folklore and mythology. However, they also sometimes contain narratives from Muslim and Sufi traditions. Traditionally crafted by travelling bards, each scroll was accompanied by a song. Thus each Patachitra was experienced as a multidimensional piece, with a narrative conveyed in both visuals and music. The tradition of Patachitras continues and contemporary scrolls often convey current events or pivotal moments in recent history. A fitting example of these Bengal scrolls can be seen in Lot 85 and 86 in the Absolute Auction of Folk and Tribal Art by Jabbar Chitrakar and Yamuna Chitrakar. These colourful works are made from natural pigments and shows two narratives simultaneously. The title Chitrakar, literally meaning painter, is taken on by the performers. Not formally trained in the art of painting, these chitrakars learn the traditional skills in a local setting, becoming travelling showmen who are adept in more ways in one, donning multiple roles- painters, singers, performers, storytellers. 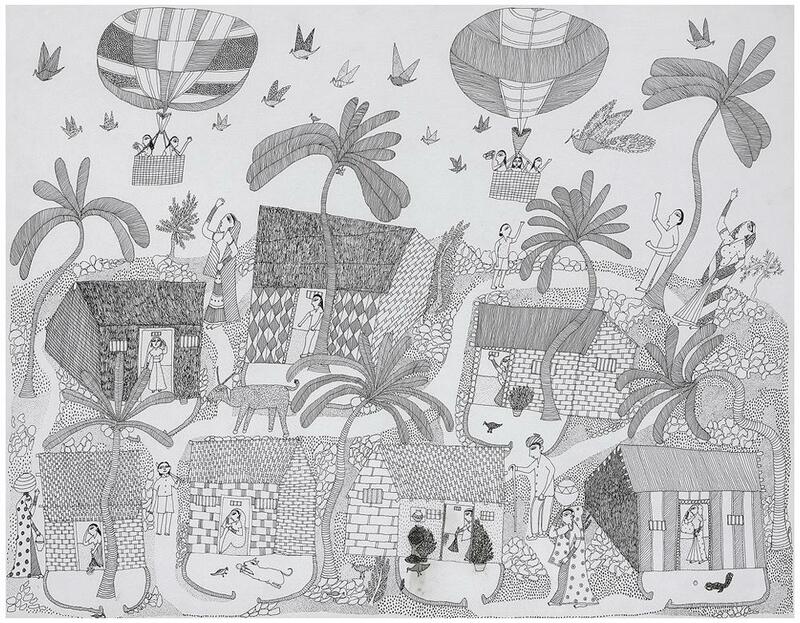 Much like the scroll paintings of Bengal, Jogi Art has an interesting history. Ganesh Jogi, the namesake of this artistic form, performed as a musician in Rajasthan. Following the traditional professional associated with the Jogi caste, the family would wander the streets in the early hours of the morning, singing devotional songs and receiving grains, clothes and occasionally money from people. Due to changing times they had to move to the neighbouring state of Gujrat to seek a livelihood. A chance encounter with the eminent artist and anthropologist in the 1980s laid roots for the blossoming of this visual art form. 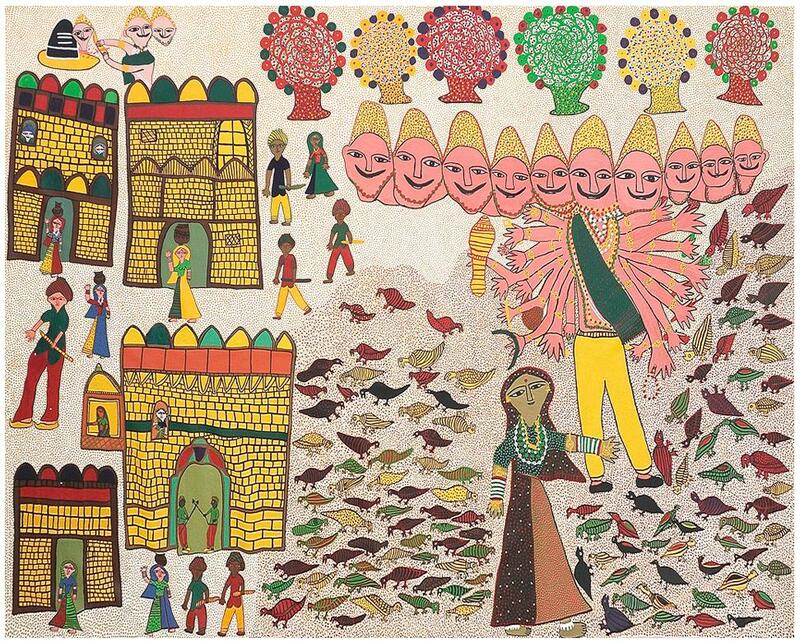 Shah encouraged Ganesh and his wife Teju to draw from their hearts and imagination images that inhabit their world. Over time these illustrations became detailed and complex, a true visual delight. The current lots showcasing Jogi Art present the evolutionary and transformative potential of traditional artistic practices. They present varied themes that include village life, current events and contemporary discourses like environmentalism. StoryLTD’s upcoming auction of folk and tribal art presents an opportunity to partake in India’s traditional visual practices, the range of artworks included in the sale are sure to peak one’s curiosity about the indigenous art genres existing in the different regions of the subcontinent.